Tap the power of the swarm. Record. We all waste too much time with searching for mathematical information that is already out there. As a student, before the dawn of the internet, I wasted days in the library, on chasing references to the secrets of the universe. Now the internet exists, but we still waste time searching randomly. Things have not been connected. The nnLab means to connect the dots. The idea is that you stop searching randomly and just follow the links. Hypertext. That was the original vision of the web. We need more research-level maths hypertext. As long as the centuries continue to unfold, the number of books will grow continually, and one can predict that a time will come when it will be almost as difficult to learn anything from books as from the direct study of the whole universe. It will be almost as convenient to search for some bit of truth concealed in nature as it will be to find it hidden away in an immense multitude of bound volumes. When that time comes, a project, until then neglected because the need for it was not felt, will have to be undertaken. Thanks to encyclopedic ordering, the universality of knowledge, and the frequency of references, the connections grow, the links go out in all directions, the demonstrative power is increased, the word list is complemented, fields of knowledge are drawn closer together and strengthened; we perceive either the continuity or the gaps in our system, its weak sides, its strong points, and at a glance on which objects it is important to work for one’s own glory, or for the greater utility to humankind. If our dictionary is good, how many still better works it will produce. We are in an age where in theoretical physics we are supposed to work on quantum gravity and unification, needing the very latest of the developments in mathematics. At the same time we still bring up students with old textbooks. This way even the best of them at the end of their study can only grasp a tiny fraction of the big picture, because the knowledge is so scattered in tiny sub-expert communities. This is insane and unnecessary. The nnLab means to connect the dots and show the big picture. That’s why it’s organized by higher category theory. This is the structure that helps organize things and bring them together conceptually. (While of course many specific entries need not be category theoretic at all). Provide a place where all the notes that we all make merge and become better. Sometimes I see people proudly show me their private maths notebooks. Too bad that only one single person is profiting from it. We are an army of wheel-reinventers. (That’s necessary to some extent for personal exercise, but we’ll get nowhere if every single person retraces every single step. That has ended being sensible several hundred years ago.) At the same time people are eager to throw around information, such as on MathOverflow. The nnLab is to collect the stable bits, organized, hyperlinked, usefully. We all exchange lots of questions and answers on research over coffee, in emails etc. When the next person comes and asks the same question we repeat it. And next time again. That’s a waste of energy, even in an infinite life. 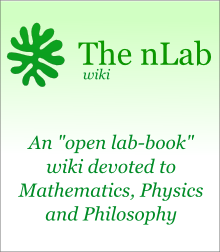 If you have an answer and you put it into the nnLab, next time you just link to it. For instance, whenever I want to say anything substantial on MathOverflow, I first put it on the nnLab (if it’s not already there) and then link to that in my answer. Last revised on March 22, 2019 at 01:35:44. See the history of this page for a list of all contributions to it.